Maybe our throttle will be throttled, effectively increasing internet speed. Given the condescending tone of your post, I fear you're not really interested in debate or discussion. In the interest of spreading knowledge, I'm going to compile what I know here (complete with sources! ). In the early days of the Internet, everything was slow. No high-speed Internet at all meant there weren't any streaming services, VoIP, torrents, or music services that competed with cable TV, and as everything was pretty slow already, nobody was really throttling anything. It gradually became more clear that ISPs were trying to throttle things, however, and block access to sites they disagreed with. There were initially no laws, rules, regulations or guidelines in place against this, but ISPs had much less control over their traffic than they do today, so it wasn't much of a problem... at first. Over time, it became clear that something needed to be put in place to keep the ISPs from screwing everyone over, though, starting in the early 2000s. In 2005, the FCC issued the Internet Policy Statement. This laid out clearer guidelines for the United States' policies on "net neutrality" - a term which was coined in 2003 following the FCC's decision to treat cable TV and cable Internet differently by classifying Internet as an "information service". One of the stated goals was to "Ensure that broadband services exist in a minimal regulatory environment that promotes investment and innovation". Another of the stated goals was that all Internet users are "entitled to access the lawful Internet content of their choice" free of ISP regulation or blocking. This does not match any part of what you're claiming, Flatfingers. And this is why the Net Neutrality laws were put in place, replacing the Open Internet Order. This is why we had them - ISPs doing stuff like this, despite it being clearly against rules and regulations, and relying on their armies of lawyers and "donations" to political figures to let them get away with it. Since the Net Neutrality laws went into place, the most trouble we've had with ISPs is throttling of services (Comcast forced Netflix to pay large sums of money to de-throttle their services - Netflix is a direct competitor of Comcast's cable TV). Net Neutrality also overturned the 2011 DC Circuit decision and classified ISPs as common carriers. 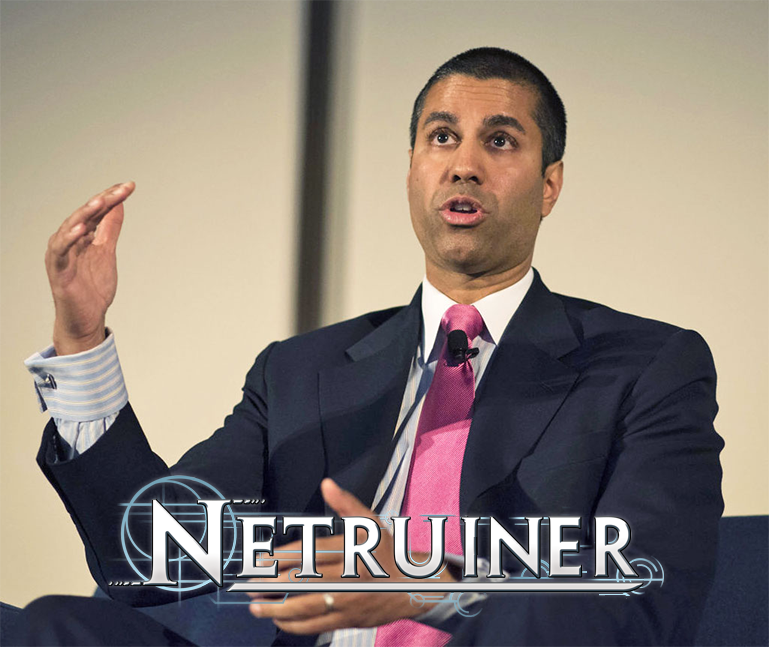 When the FCC's decision to repeal Net Neutrality goes into effect in two months, the Internet, for the first time, will be without any sort of protection. ISPs don't like competition. They are as powerful as they are because they stomp out anyone that competes with them. They even have coverage agreements in many states, so that only one ISP will cover particular areas; this lack of competition lets them push prices up for consumers almost as high as they want. They've spent millions of dollars in crushing any new ISPs that try to emerge. I understand you believe that the net neutrality regulations stifle competition and decrease investment, Flat, but I think that the Internet should be treated as a public good, as we do with telephone infrastructure. It's vital to the flow of commerce. Software companies and things like Netflix and Amazon have grown based on the expectation that traffic would be treated fairly. Now ISPs can extort them however they so well please. They can crush these companies like bugs, because these companies depend on the Internet remaining as it has been - and there are thousands of them relying on neutral Internet access. Think about all the millions of people that work for these companies - people that will be unemployed if the ISPs destroy everything they've built their lives around, just because the ISPs want less competition (as they always have). ISPs don't need less regulation. If anything, they need more, because they aren't on the side of the consumer. Laws are the only thing keeping them from choking out all their competition and squeezing as much money they can out of everyone involved. The bottom line is: net neutrality laws are important. Laws and regulations in general are important. Laws may not keep people or ISPs from doing terrible things, but they do make it possible to enforce consequences when it happens. And not crappy service for the things their isp doesnt like. Tal, I am in agreement with you that the repeal of Net neutrality in the US will have deleterious consequences. That said. let's not get carried away by what this means to major content providers such as Amazon, and Netflix. Netflix' business model was not substantially damaged by Comcast in the past and I suspect that it won't be significantly hurt by developments in the aftermath of the repeal of Net neutrality. For one, there is competition in most major markets. Moreover major content providers use distributed bandwidth across numerous service providers. While there may be an uptick in pricing, I don't expect it to be a game changer for the likes of Amazon, Apple, Google, Facebook, and Microsoft. All of these companies have the means to become their own access providers (or at a minimum to form strategic partnerships with major ISPs). With their razor thin margins and their business being entirely dependent on streaming, Netflix is the most vulnerable among corporate content providers of note. I anticipate that Netflix has already begun negotiations with carriers and, if push comes to shove, I would not be shocked to see Netflix merge with a company like CenturyLink (extensive network with a depressed stock price). I think that it is consumers (especially those in service areas without competition) who will bear the brunt of the changes to come. Though privacy concerns will impact us all. Tal, nothing I've said was intended in a condescending way. If anything came across that way, that wasn't my intention. I've spent hours that I should have been sleeping laying out a detailed factual/rational basis for the FTC-regulation position. You may disagree with those points, but what they have not been is a moralistic, emotion-driven "you people who disagree with me are all stupid or evil" kind of argument. A condescending statement would laugh at you. I'm not laughing at you. I respect your concern. I think a skepticism regarding ISPs is well-warranted. I'm not mocking you; I agree with you. ISPs are not holy saints; they will take advantage unless rules are in place to discourage inappropriate advantage-taking. Rather, my position is that skepticism regarding the motivation and competence of central-government regulators is also warranted, both generally and in the specific case of telling private businesses what they're allowed to charge for the goods and services they provide. That is not me looking down on you personally (i.e., "condescension") -- it's me pointing out what I think is an equally if not more important factor, and hoping you'll be willing to give that viewpoint the same fair and objective consideration that I give the "ISPs will take advantage of consumers if allowed to do so" position. If I've been a decent human being at other times, why would you accuse me of being a bad person now just because we disagree on some details of some techno-policy thing? I seem to have made the wrong sort of impression with my post, Flatfingers. I absolutely do not think you're a bad person. Actually, I have a great deal of respect for you. If I did think you were a bad person, I probably wouldn't have mentioned all the people that could lose their jobs over this - if you were a bad person, I doubt you would care. I was actually only trying to point out why the laws were put there in the first place, and correct some of the other things you've said (such as "net neutrality didn't exist before 2015 and we were doing fine then"); I was trying to patch what I saw as holes in your knowledge and point out why net neutrality existed, why it's important, and why the complete removal of those laws is a Very Bad Thing. Reading this most recent post of yours, I now know that you do somewhat agree with me that ISPs need to be regulated - and possibly also believe that the complete removal of all net neutrality laws is not a good decision (or at least, in your case, not completely a good thing). I think our point of disagreement, then, is how much ISPs should be regulated, and whether all data should be treated equally. For what it's worth, I'm sorry I misunderstood and thought you were being condescending. There were a few points in your posts that seemed like quiet jabs, but I've read into things before, so that's nothing new. This appears to be a strawman argument. The 2015 rules do not involve the government telling carriers what they are allowed to charge for broadband services. Rather, it puts in place rules that prohibit carriers from variably pricing broadband based on the origin of data. The rules effectively prohibit discriminatory throttling by ISPs. Even with the repeal of the 2015 Net neutrality rules by the FCC, the fight over Net neutrality is not over. There will be court challenges in the coming months and at some point Congress is likely to legislate on the matter. The FCC imposing and verifying compliance with "rules that prohibit carriers from variably pricing broadband based on the origin of data" is not different in any meaningful way from "telling private businesses what they're allowed to charge for the goods and services they provide." These are just two different ways of saying the same thing: ISPs are to be prevented from performing legal business actions. I agree with critics when they observe that ISPs are imperfect and will sometimes get so big that they try to unfairly block competition. When this is the case, there is a remedy: the Federal Trade Commission exists to investigate and, where reasonably confirmed, block significant anti-competitive actions. If this is your concern, then you ought to support this week's revision of the FCC rules to restore oversight to the FTC because that addresses your concern. But that is as far as regulation should go. Pricing should be controlled by the businesses who are subject to market forces, not by unaccountable DC lawyers. If you want to object to this by saying regulators need control because ISPs "might" do something bad, I will counter that pricing needs to remain with consumer-dependent businesses because price regulators "might" not have the first inkling of a clue about the negative business impacts -- that reduce consumer choice -- of preventing varied pricing based on usage, and they "might" abuse their regulatory power just as people in other agencies have. In short, I acknowledge the failings of ISPs and I support a responsibly limited regulatory oversight of all businesses, including ISPs, to prevent fraud and significantly anti-competitive actions. The pro-NN position would be considerably stronger if its proponents could equally acknowledge that more regulation also has dangers. and providing the same service 5 times with different prices depending on who asks is not fraudulent? because theres literally no difference in network strain if i get x mbit of bandwith from netfix or youtube or ISPVideo. then the loud NN enemies may start with an explanation how the n mbit tISPs sell to their customers converging on a few sites (which all pay for their full bandwith as well) somehow is not bearable until the minute the offending site coughs up some additional cash. what do customers pay their bandwith for now if not to use it to communicate with other users? why are they suddenly putting up an unduly strain on the network when they utilise the service they pay for? also: how is degrading QoS for service providers (non ISP services) that dont pay an additional protection racket increasing customer choice? and theres enough ways to do usage based payment without opening the door to discriminatory and abusive business practices. if you need a lot of total data and the unlimited-bps-but-limited-volume plan is too expensive for you get something thats rate limited but with effectively unlimited volume. like the connection i have at home which would cost many hundreds of euros per month if i were to get something equivalent to my mobile contract with the same cost per byte as my mobile contract. and i can make use of any services on the web i want without having to think about if i bought the package for that specific page. whereas with the "perfectly fine" segregated offerings i'd be limited to the packages my ISP offers / i already pay for and may not be able to reach the services i'd like to without overproportional expenses on my side (i'd definitely think twice if i try amazon prime if i'd have to pay an extra 5 bucks to reach them at bearable bandwith when i already pay for netflix or get my ISPs video on demand service without extra fees). if there were only ISPs to think of i'd maybe agree with you. but theres a whole world in the web thats not ISP services. and i'd like to be able to access those without having to pay twice. It's not going to be the best analogy, so bear with me here. 1. ISPs being able to decide how much they charge based on who the purchaser is, is essentially the same as you going into The Store and the owner charging you, at the register, five times as much as everybody else in line just because they don't like you - and getting away with it. ISPs have done this. 2. ISPs being able to throttle sites that compete with them, or that they simply don't like - is essentially the same thing as the owner of The Store saying that they don't like you, so you are only allowed to purchase up to $10 worth of goods at a time. ISPs have done this. 3. ISPs being able to throttle you and then force you to pay more money in order to continue using their service is essentially the same as a store owner blocking access out of his store until you pay $500. You are not allowed to leave with your purchases - or at all - until you pay this much. Comcast did this as recently as last year to Netflix. 4. ISPs being able to charge non-company customers of certain sites more or less depending on how much they like them, or which sites they visit, is essentially the same as the owner of The Store charging any customers of your floral business twice as much as everyone else, just because they go to your business and not his. This is the only thing on this list that ISPs in the United States have not done, and only because it's impossible to get away with it quietly. ISPs in countries without net neutrality (lowercase) laws get away with charging people more to visit specific sites for specific numbers of hours. There are even "caps" on how much you are permitted to visit different sites - unless you want to pay more to unlock "more hours". 5. ISPs being able to discriminate between potential customers is essentially the same thing as preventing anyone that purchases flowers from your floral business from entering The Store in the first place. Their choice is now to either live without food, or switch to The Store owner's floral business for their flower purchases. There's not really much of a choice here. ISPs are notorious for doing this. You are competition. Killing you off means they make more money. As large corporations, that's all they really care about. They wouldn't be large corporations if they cared about people. 6. ISPs being able to completely block all traffic to sites they dislike is essentially the same as The Store owner setting fire to your business and burning it to the ground. Both sides of this analogy end with the targeted company crumbling. ISPs have done this a number of times. I listed some of them in my post with sources. There are now no laws in place in the US to prevent any of this from happening. All the previous laws were merged with the 2015 Net Neutrality laws, which Ajit Pai & Co. eradicated on the 14th. Nothing protects small business or companies anymore, and nothing protects consumers. Read above. I explained how it is not legal in this context. Store owners are permitted to charge different prices for their services and goods. A can of chicken may cost twice as much as a can of meat, and this is legal. However, everyone that walks into that store must pay the same price for that can of beef as everyone else. Charging people more or less based on who they are - which is what we're talking about - is illegal. I agree with critics when they observe that ISPs are imperfect and will sometimes get so big that they try to unfairly block competition. When this is the case, there is a remedy: the Federal Trade Commission exists to investigate and, where reasonably confirmed, block significant anti-competitive actions. ...Except Ajit Pai closed the investigations into the illegal actions of Verizon and AT&T earlier this year. He would continue to do so as long as he's in office - but he won't need to now that all the laws protecting consumers are gone. The FCC will no longer investigate and block significant anti-competitive actions. If they would, the FCC chairman wouldn't have shut down the investigations. ..."Might"? Did you read my post? They've been doing this for over a decade - and, usually, not getting away with it. I even provided a huge list of sources to back it up. If they tried this hard when it was illegal, do you really think they'll suddenly stop because it isn't illegal anymore? That implies that they were only doing things because they were illegal, which doesn't match your interpretation of Big Government being more evil than Big Corporations. I'm pleased with this, Flatfingers. I had gathered as much, but the part you're missing is that there isn't any regulatory oversight anymore. Everything that was in place is gone. The anti-NN position would be considerably stronger if its proponents could equally acknowledge that a complete lack of regulation has more dangers than what we've had in place since 2005. Now, if you're wanting me to acknowledge that more regulation also has dangers: Yes. I will agree with this. If the government tried blocking data in and out of the country (so that we wouldn't know how much better "the folks outside" had it), or if they tried shutting down sites that said negative things about the people in power, this would be too much regulation. I also agree that the government has spied on Internet traffic altogether too much in the past (NSA, anyone?). However, none of these things have anything to do with Net Neutrality. Flatfingers, your argument ignores the fact that in the absence of new legislation broadband services are regulated under the Telecommunications Act of 1996 . In addition, to the above articulated aims there are significant antitrust concerns. Not only are there significant barriers to entry but, as pointed out by Talvieno, in much of the United States broadband services are provided by duopolies and in some cases outright monopolies. Finally, the largest broadband carriers are themselves frequently also content providers, as such they have demonstrably competing interests when it comes to delivering fair and equal access. The reality is that regulation is required for the common good. It’s only been a week since the Federal Communications Commission repealed net neutrality protections and Republican lawmakers are already trying to set legislation into motion to cement the controversial ruling. On December 19, representative Marsha Blackburn proposed the “Open Internet Preservation Act” in a video on Twitter. In the announcement, the Tennessee Republican touts that this bill will prevent blocking and throttling of legal web content, but she elides that this would bar the FCC from creating any rules that go beyond those requirements. Blackburn’s proposition would also keep any states from enacting any of their own net neutrality legislation. While Blackburn’s statement on Twitter made it seem like the goal of the Open Internet Preservation Act is to restore the net neutrality regulations previously in place through the FCC’s rules, the bill would actually take away key protections. Most importantly, it would still allow for the creation of Internet “fast lanes,” which means everyone gets a baseline browsing speed but ISPs can charge users or websites more for access to faster internet. There is so much misinformation in this thread that it would take far more time than I am willing to invest to address all of it, but I'll give my (abbreviated) 2 cents as someone who is in law school and is studying this area. Those in favor of net neutrality generally do not trust ISPs (corporations) and are more wiling to place their faith in government. Those on the other side tend to view the government with more suspicion. The truth is neither side in this equation has clean hands, as any organization made up of people is going to be inherently flawed. The single best argument for net neutrality is that many, if not most, municipalities in the US have government enforced monopolies for providing cable and internet and therefore government intervention is needed to make sure these providers don't abuse their monopoly. However, the counterargument is that these governments shouldn't be creating these monopolies in the first place, and without monopolies competition would exist to provide a check on the behavior of the internet providers. Those in favor of net neutrality would do well to not to blow the implications of the changes out of proportion. Some of the predictions of impending doom and peril as a result of policy changes are quite frankly embarrassing and make it hard for those on the other side to accept your arguments. The fact is that net neutrality was not in place until 2015. This forum was around for a few years prior to that. From an economic perspective, this will cause higher costs for companies that use more bandwidth. You would see lower prices from your ISP because they should bring in more money, however the lack of competition due to gov't policies leaves little incentive to lower prices. What would likely happen in a truly free market is you would see higher prices for things like Netflix, Hulu, Xbox Live, etc, but you would have lower prices for your internet. Essentially those who aren't using Netflix wouldn't be paying for it as they are now. In other words, in order for a net to work without neutrality, more moves should be made to encourage a level of competition that holds ISPs in check. If the political courage to do this is lacking, a policy like net neutrality may be necessary. You are talking about Net Neutrality, not net neutrality (capitals matter). I provided sources to different government documents showing that net neutrality was, in fact, in place before then - not as law, but as policies to keep corporations in line. I agree with a lot of the rest of what you said. Ideally, there would be enough competition between ISPs that they would keep each other in check, so the government didn't have to worry about it. Sadly, as you pointed out, this is not the case. Perhaps that's what we should be focusing on - but for the moment, I'd like the 2005-2015 net neutrality policies to stay in place long enough for that to actually happen, so we aren't giving full control to the people that already have monopolies. After that's restored, we should focus on getting rid of those regional monopolies. I don't honestly believe those should be a thing either.